ISBN: 9781922144140 (pbk); 9781922144157 (ebook); xiv + 263 pp. 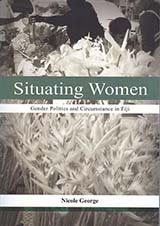 This monograph, Situating Women: Gender Politics and Circumstance in Fiji by Nicole George, provides unique analyses of Fijian gender politics and particularly how Fiji's women's organisations have responded to the often dramatic, changing political circumstances since independence in 1970. And it is easy to sympathise with George's major project here. Fiji's modern political history has been nothing if not masculinised and male-centred, and academic studies have undeniably had the tendency to privilege men's voices when discussing Fijian development. This is despite the fact that Fiji's women's rights organisations are diverse, prominent in public debates, and as resilient as they are progressive. It is thus pleasing that Nicole George does such a splendid job in bringing these movements to the forefront of the political analysis of Fijian society since independence. Spanning the entirety of the first forty years of Fiji's independence, the book is organised chronologically with most chapters dealing with the specific political changes occurring in a ten-year period. This enables her to highlight how women's organisations have been involved in shaping the modern, Fijian nation state to a much greater extent than they have been credited for in established history narratives, while also giving voice to a number of stories which have seldom been told. George shows how women's organisation went from being relatively disengaged in local and international politics in the 1960s to becoming significant public advocates in the early years after independence. What is particularly interesting is how these movements went beyond traditional feminist issues to position themselves as social activists. The Fijian branch of the YWCA and later the Fiji Women's Crisis Centre were early and active proponents of economic justice and racial equality within Fiji, arguably the two issues that came to define Fijian politics in the decades that followed. At the same time they were also early proponents of contextualising their own struggle in a regional and international context, quite a feat for these small, marginalised women's organisations located in a Pacific Island state in its infancy. George's knowledge on the organisation of Fijian feminism is encyclopaedic, and her key arguments are further strengthened by her privileged access to a great number of main players in the field. From the outset she combines archival data and political analyses with personal interviews with a number of women who have been instrumental in the development of Fijian women's movements. George's passion for the subject matter as well as her admiration for her research respondents are obvious and make this a vivid historical chronicle. The book is theoretically strong and provides a coherent research narrative. As indicated in the title, George draws extensively upon Donna Haraway's notion of 'situated knowledge' in shaping her analysis, and many other buzzwords from the post-structuralist feminist vocabulary recur in the text. Her attention to 'intersectional influences' (p. 9) on women's disadvantage has been particularly influential on her methodology. This is reflected in how she successfully manage to analyse Fijian women's movements as emerging from and centred on local issues as well as being subject to consistent transnational influences. It is really these theoretical reflections, most evident in the final sections of each chapter, which drive the narrative of this book and make it a highly useful text for anyone interested in feminist theory. The book itself is of course situated within a field of political science that privileges overtly political organisations over everyday fields of social practice as sites of analysis. While this corresponds well with her emphasis on women's political agency in a particular ethnographic context, and how this is shaped by broader political contingencies, a more consistent reflexivity in terms of how this approach qualified and limited her research focus would be welcome. On a related note, as an anthropologist I found myself wanting to learn more about Fijian women's lived experiences behind the political scene, and it would be interesting to hear more stories about how women outside organisational life perceived the impact of the organised women's movements throughout this era. I realise, however, that it would be unfair to criticise Nicole George, who is a political scientist, for not writing such an ethnographic text, and I intend this last comment to be a suggestion for further research directions in the field rather than to point out any distinct shortcoming with this book. Some traces of the book's previous life as a doctoral thesis remain; some descriptions are a little dense and the level of historical detail can at times seem distracting for a reader whose chief interest lies in gender politics and women's lived experiences. These are, however, minor flaws in a book which is both ambitious and sophisticated. Overall, Situating Women: Gender Politics and Circumstance in Fiji presents as a solid piece of work which makes a most welcome contribution to the total body of knowledge on gender relations in Fiji and the Pacific. I for one would not hesitate to recommend it for students and scholars wishing to specialise themselves in Fijian issues, feminist history, or gender politics at large.